Everyone who saw it has their own memories of that fateful day. You only have to mention the 1996 Masters, and Faldo/Norman, and they come tumbling out. Television viewers recall simply how difficult it was to watch, how the prolonged agony became so disquieting. Those who were on the course remember the unnatural hush, people looking at their feet as the final two players passed by, spectators flooding for the gates well before the finish. The outcome had appeared certain when Norman led by six strokes at the start of the day but the reversal of fortunes was so dramatic that Faldo eventually won by five. ‘It was a wedding that turned into a funeral,’ someone said of the atmosphere. Others’ instinct was immediately to mention the press conference afterwards when Norman fronted up to every last question about how devastating it must be for the green jacket to slip through his hands yet again, repeating as often as was required that he would be fine, thank you. only added to the chaos. The initial problem was the failure of the modem on my battered old Apple Mac, while another laptop, kindly but unwisely lent by a colleague, died when I spilt Coca-Cola on it. A borrowed Tandy, that clunky but indestructible pre-laptop word processor, enabled me to file the ‘on the whistle’ close-of-play report. , was in relaxed mode. The old pro did not have to change a single word. It is fair to say that retreating from a post-round huddle with Colin Montgomerie, who had delivered a five-star woe-is-me rant after taking a triple-bogey eight at the 15th for the second day running, on this particular occasion I was less than sympathetic and inclined to observe that Monty did not know the half of it. in London. Peter Morgan’s play set up the series of interviews as a battle of wills, almost as a sporting duel. But rather than boxing or fencing, it suggested to me the long-drawn-out psychological warfare of golf. And the notion that a supposedly dominant participant should ultimately capitulate under the sustained pressure and perseverance of his opponent suggested one tournament above all others: the 1996 Masters. It seemed obvious this was a story worth retelling. Looking back, the events of Sunday 14 April 1996 not only sealed the verdicts on both men – Norman, the great showman whose go-for-broke golf let him down too often when it mattered most; Faldo, feared and respected rather than loved but at his best when the pressure was at its greatest – but also on an era of the game. After Tom Watson, the latest in a long line of American golfing legends, had dominated in the early 1980s, a new group of international stars had emerged – including Seve Ballesteros, Bernhard Langer, Sandy Lyle, Ian Woosnam and Nick Price. Faldo and Norman, both having been ranked as the world’s best player for lengthy spells and after numerous head-to-head contests, were the last men standing from that new generation. A year on from their climactic encounter at Augusta, the game would have a new superstar. Tiger Woods had the power of the Australian and the precision of the Englishman, which proved an all-conquering combination for so many years. No matter whether the Tiger era is over, enough golfing history has been made in the meantime that it is relevant to be reminded of an earlier age. presaging his future career. At the US PGA in 2013, Jason Dufner equalled the major championship record of 63, just as Norman had done at the 1996 Masters. And there was even a golfer, Inbee Park, trying to win her fourth major championship of the year at St Andrews, where Masters founder Bobby Jones started his Grand Slam in 1930. 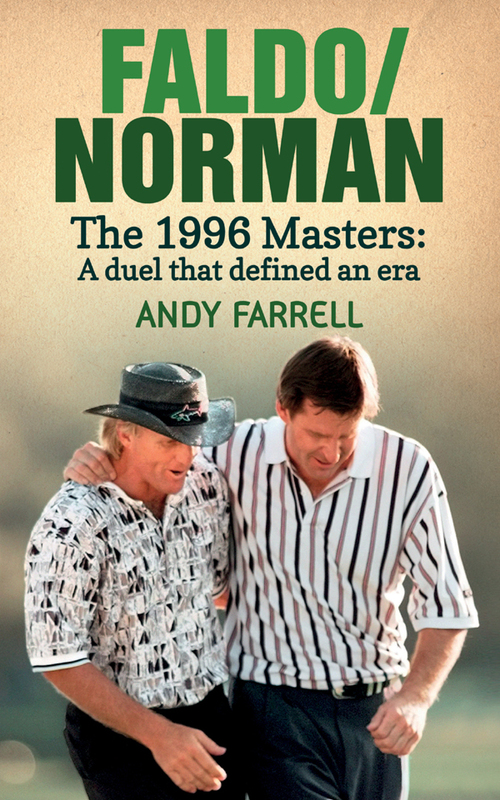 It was time indeed to return to the story of Faldo/Norman and the duel that defined an era of the game when an Englishman and an Australian vied to be the best player in the world. came to the 1st tee with a six-stroke lead. This was the final round of the 60th Masters and everyone standing around the tee box – no need for grandstands at Augusta National as there are at the Ryder Cup and even the other major championships these days, the players are separated from the public by a simple rope line – believed that he was going to win. So did virtually everyone else who had come onto the grounds that morning, now lining the 1st fairway or staking out the prime positions around the course. For those just yards away around the 18th green, nothing could be more certain than the identity of the winner who would salute them at the end of the afternoon. Television viewers might have thought something similar, except coverage of the climax of golf’s first major of the year did not start for another hour or so. But make no mistake, this was going to be a parade, at the end of which the Norman Conquest of Augusta would finally be complete. tournament to win. He led by six strokes but they had only played 54 holes, there were 18 still to come. A quarter of the marathon still to be raced. Norman told himself to treat the round as if he had no lead at all. If he wins on the day, then he wins the title. Keep it simple. Another person who did not think it was a foregone conclusion was the other player standing on the 1st tee. Nick Faldo did not think he would win. But he had not ruled out the possibility that he could win. If nothing else, out of sheer bloody-mindedness, he was going to pretend he could win and see what happened. Most people, however, chose to believe the evidence of the leaderboard, which showed Norman at 13 under par for the first three rounds. He had equalled the course record of 63 in the first round to lead by two strokes, and then followed up with a steady 69 in tricky conditions on Friday to extend his lead to four strokes. On Saturday he again added two strokes to his lead after returning a 71 to the 73 of his nearest opponent, Faldo. Norman appeared to be striking the ball as well as ever and, just as importantly, had the assured look of a player who was in control of his game and his mind. Not even playing alongside his old rival in the third round had disturbed his equilibrium. But Faldo had not gone away. His putting had gone through a wobbly patch on the back nine on Saturday but had come good just at the right time, producing a birdie at the 17th hole and a par-saver at the last to ensure he again played alongside the leader on the final day. Faldo and Norman had spent 20 years crossing swords on the fairways of the professional game. In the previous decade they had each in turn been the best golfer in the world. Following on from Tom Watson and Seve Ballesteros in the early 1980s, Norman and Faldo had become golf’s premier rivalry. to Norman and Faldo, among others. It has since evolved into today’s Official World Golf Rankings but in its first decade of existence it showed Norman’s dominance of the game. In all, the Australian spent 331 weeks as number one; Faldo was the next best on 97 weeks. It was during that year (1986) that Norman won his first major championship, the Open at Turnberry. He won it again at Sandwich in 1993, the greatest performance of his career as he raced clear of all the best golfers of the day, including Faldo. But in between Norman’s twin triumphs, Faldo won five majors – the Open three times and the Masters twice – putting him alongside Ballesteros as Europe’s most successful player. When it mattered most, Faldo came out on top more often. Wasn’t it Norman’s hero Jack Nicklaus, the game’s greatest major winner with 18 titles, who said that he could play his game longer than others could play theirs? Let the other guy make more mistakes than you.